This is a fantastic show and in my opinion one of the top shows on TV! Well developed characters, well edited, and imaginative writing. On a par with Game of Thrones, Stranger Things and Daredevil, this should definitely be renewed! I think one of the reasons for lower ratings is the fact that the people who watch it on Netflix don’t necessarily watch it on AMC and vice versa. Plus it airs late on Mondays. Odd programming for such a good show. 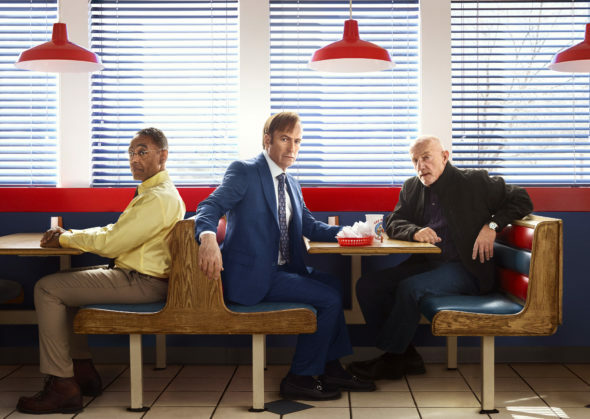 We are loving Better Call Saul season 3. Can’t wait for seasons 4and more. Excellent series. Would also like to know what happens to Saul after Breaking Bad. Any chance? I hope there will be a fourth season. When it is finally over I will have to watch Breaking Bad again. I love both shows! Excellent! Follower from Spain. A whole lof of people would love to have a 4th and 5th season… Excellent series. Absolutely renew!!! Love this show!!! More please!! Loved it..watched on Netflix in Ireland. there is much more to explore, right up to his meetings with the BB guys. Also more on how Mike starts working for the chicken guy…and what was Chuck up to in that last call? Totally agree Michael. As I said in my comment above, ratings is one of the biggest hoaxes and inexact “sciences” known to man. Absent some pretty fantastic technical wizardry which I do not think even exists, I do not think they have any idea what Series have high ratings and what shows do not. We no longer tune in…..Cancel it! I think we are past the days where a show success is on how many people watch it on cable. The show also is on Netflix. Worldwide! I doubt AMC would rely on cable ratings.